Patrolling nearly 3,000 acres of parkland, 62 miles of paved, 36 miles of river trails land 12 miles of hiking trails, GCP&T rangers work seven days a week to keep park patrons safe. Photos courtesy of GC Parks One of the first GCP&T rangers, Ed Bice, visits with current GCP&T Park Ranger Lance Geldbaugh. 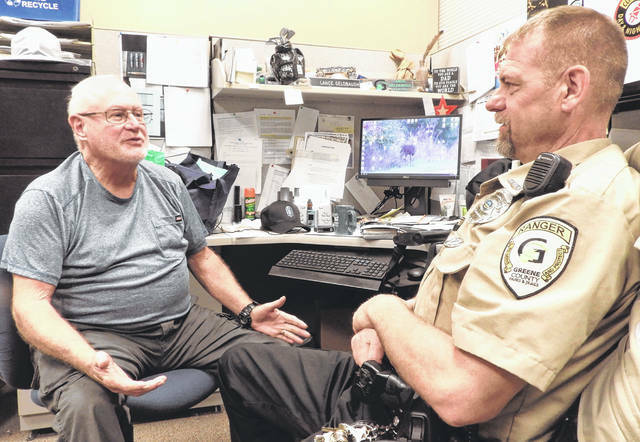 XENIA — With walkie-talkies that only transmitted for two miles and one uniform each to patrol on weekends only, the Greene County Parks & Trails (GCP&T) ranger division was created 40 years ago with three staff members who already had ‘day’ jobs with the department. One of those first rangers remembers how the trio would work their primary job during the week and ‘patrol’ on weekends. Bice distinctly remembers how the need for rangers became apparent. One weekend morning around 1 a.m., he remembers being called out to the Narrows Reserve near the Sperling Lane entrance. A large party was in full swing with noise, alcohol and other illegal activity. The Greene County Sherriff’s Department, Ohio State Highway Patrol and local police were all on the scene. Bice immediately went to then GCP&T Director Ed Dressler and asked if three staff members could go to a parks law enforcement training at Western Michigan University. Dressler, however, discovered a ranger certification course offered through Cleveland MetroParks. With a very tight budget, the three attended and literally relied on C-rations for food during their training. After their three, 10-day training periods, Bice, GCP&T Maintenance Supervisor Rick Bull and GCP&T Naturalist John Humston were commissioned as rangers in 1979. At the time, the ranger team could have been commissioned by either the Greene County Sheriff Department or the Greene County Park District, he remembers. Greene County Sheriff Russell Bradley did not allow facial hair so the rangers were commissioned by the Greene County Park District Commissioners —- Nancy Hammond, Tim Campbell and Dr. Vivian Lewis. The team received fire certification training from the Greene County Sheriff Department. Bice held his ranger commission for three years and created many of the park rules and regulations. He remembers, however, only giving out one ticket. When Bull decided to give up his commission, Sam Tackett came aboard. Tackett is remembered as a one-armed ranger with a hook for a hand who shot left-handed, Bice adds. The first team of full-time rangers included Bill Nickell, Brady Smith, Dale Steele and Joe Thorne. Nickell retired from the park agency, Steele serves as Great Parks of Hamilton County Assistant Chief in Hamilton County, Thorne is a deputy with Greene County Sheriff Department and Smith is Chief Ranger with the agency. Bice remembers his colorful past days as a ranger fondly. 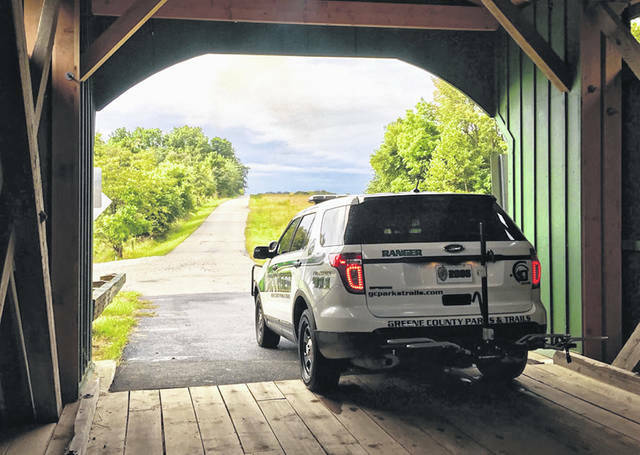 https://www.beavercreeknewscurrent.com/wp-content/uploads/sites/49/2018/11/web1_rangerballardroad.jpgPatrolling nearly 3,000 acres of parkland, 62 miles of paved, 36 miles of river trails land 12 miles of hiking trails, GCP&T rangers work seven days a week to keep park patrons safe. https://www.beavercreeknewscurrent.com/wp-content/uploads/sites/49/2018/11/web1_rangertalks.jpgPhotos courtesy of GC Parks One of the first GCP&T rangers, Ed Bice, visits with current GCP&T Park Ranger Lance Geldbaugh.